Take train to the Cochem (Mosel) train station. The station is 1.4 km away - a brisk 15 min walk. Take either Autobahn A1 or A48 to Bundestraße B49, then K20 to K22 and it will lead you right to the castle. You'll want to take shuttle-bus 781. It runs only from April 27th until November 3rd. Bus times run about every 20mins. The bus station is only 150m from the castle. The Cochem castle is within the town of Cochem is characterized by winegrowing and tourism. In German this castle is called Reichsburg Cochem, and is a place where history comes to life. Cochem Castle dates back to the first millennium, the year 1000 A.D. It was the home of the Palatinate counts and was built on the orders of Count Ezzo. The castle was used mainly as a defensive structure. It was said that at one time, it housed as many as 40,000 knights. The Sun King Louis XIV attacked and burned the castle to the ground in 1688. It wasn’t until 1868 that Mr. Louis Ravené, a Berlin businessman, began to reconstruct it in the Neo-Gothic style that we see today. The castle sits on a 100 m hill overlooking the River Moselle. There are many tours and activities to be involved in when visiting the Cochem castle. You can take a ghost tour which allows you to see rooms that one cannot see on a regular tour. There's a landscape garden tour that takes you along the sepentine steps through trees and flowers with some extraordinary views. Also there is a nightwatchman tour where a guide will entertain you with some of the most interesting and unusual tales of the castle. There is a popular legend of a servant who was traveling and overheard a group of armed men planning an attack on the castle. So he rushed to the castle to warn them and when the armed men showed up they were overwhelmed by the well prepared knight of the castle. The knights of the castle celebrated with food and wine. This started a tradition called Knipp Monday. One can experience this tradition after a tour of the castle by participating in the Kight's Meal. The Lord of the Manor will greet you with a cup of the local Moselle wine and sit you down for a four-hour extravagant feast. Come see the beautiful architecture of the castle and see the beautiful landscaping surrounding the castle. Besides the tours there are always events going on at the castle. There are the falcony shows, castle festivals, wine galas, and many more. This modern penthouse apartment is located in Cochem, directly on the banks of the Moselle River. Facilities include free WiFi and a balcony with panoramic views of the harbour and surrounding vineyards. This 5-star apartment hotel in Ediger-Eller is located on grounds belonging to a monastery. 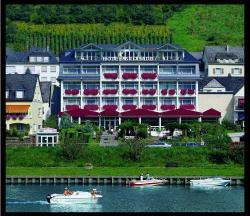 It offers great views of the vineyards along the River Moselle, a free outdoor pool, and varied breakfasts. Directly on the River Moselle and a 10-minute walk from Cochem town centre, this hotel offers panoramic views of Reichsburg Castle and Cochem’s old town. It offers spa facilities and gourmet food.